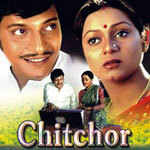 "Chitchor" is a 1976 hindi film which has Amol Palekar, Zarina Wahab, Vijayendra Ghatge, A K Hangal, Raju Shreshta and Dina Pathak in lead roles. We have 4 songs lyrics and 4 video songs of Chitchor. Ravindra Jain has composed its music. Yesudas and Hemlata have sung these songs while Ravindra Jain has penned its lyrics.